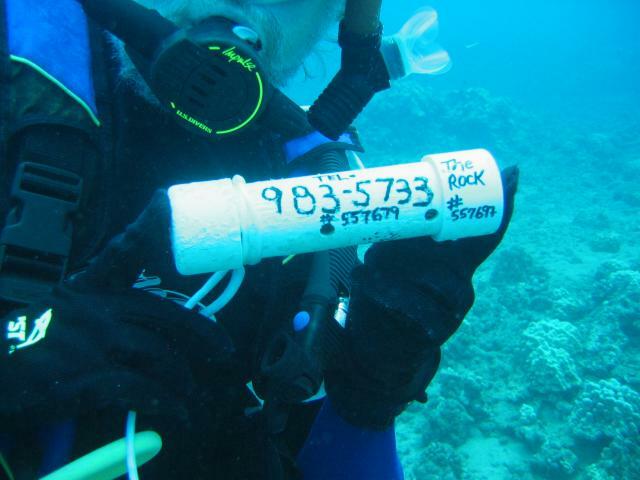 This week we resumed the quest to find 5690, the lady who nested in Lahaina last summer. 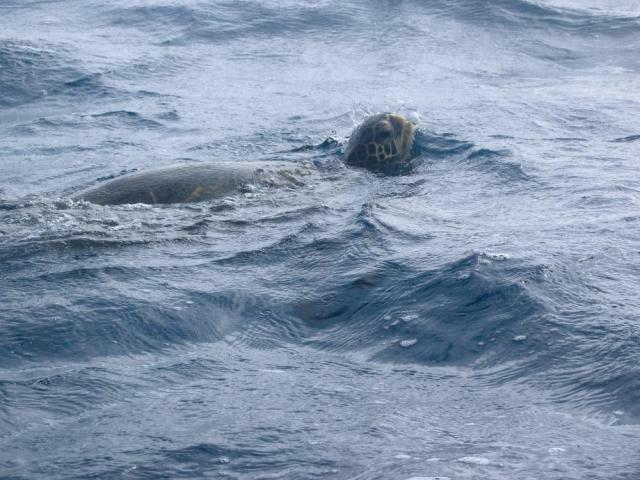 Although she had been spotted frequently at Napili Bay, we got a tip that she had moved north about 1.4 kilometres (.87 miles for the metrically impaired). This turned out to be an area just off rocky Hawea Point. Naturally, we had to hike up there to check. We heard 5690 was just off rocky Hawea Point. Much to our delight, we were soon able to spot her antenna through our binoculars! Although this gave us a great thrill, we realized that it meant that fulfilling the second part of our vow--getting a picture--would be a whole lot harder. It was clear that the next step was to call out the navy. 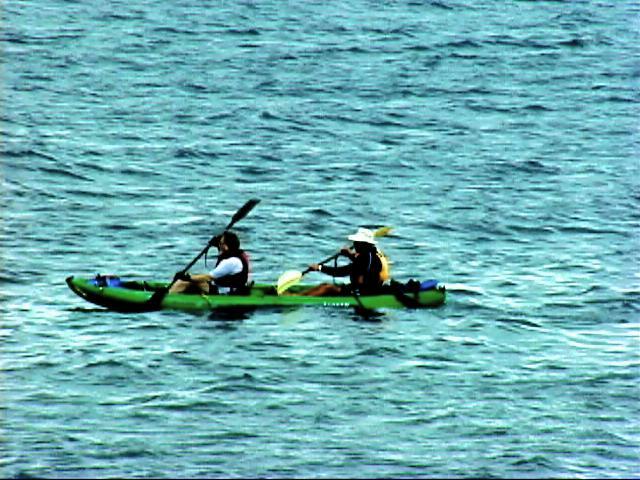 It just so happens that our good friends at the Kapalua Dive Company also conduct kayak tours, and one of their regular destinations is Hawea Point! Usually, they bring their customers into the calm waters in the lee of the point, but once we explained our mission, kayak instructor Mickey McAfee was ready to take on the challenge. It was clear that the next step was to call out the navy. The plan was to have Ursula stay ashore and watch with binoculars, while Mickey took Peter into the rough waters on the windward side of the point where we knew she was likely to be. Through a sophisticated signal system (hat-waving) the spotter would guide the kayakers to 5690. One problem. 5690 wasn't in on the plan. We did see turtles, but not the object of our desires. It wasn't meant to be--at least that day. We don't give up that easily, however. We engaged Mickey's services for the next day, and kept our fingers crossed. Day two began with a drop in the trade winds. Great, we thought, the water won't be so rough. Wrong! There's something about Hawea Point that defies logic, at least when it comes to water conditions. When Peter and Mickey arrived, there were whitecaps everywhere. The chop made the watch interesting, to say the least. Fortunately, it was worth it. After about 45 minutes of patrol, 5690 came up for a breath of fresh air. The kayakers paddled fiercely to get close enough for a picture--and succeeded. Sort of. The kayakers paddled fiercely to get close enough for a picture--and succeeded. Sort of. This time the problem was inexperience with the Canon Powershot S45 in its housing. It was exceedingly difficult to squeeze off a shot at exactly the time 5690 decided to pose. The image we're showing you is actually cropped from the lower left corner of the frame, and suitably enhanced to remove the effects of mist on the port of the housing. We were just starting to realize how difficult this quest would be. Day three brought calmer waters--but no 5690. The good news was that our new strategy worked. Peter managed to squeeze off some nice shots. Now all we need was 5690 to co-operate. The good news was that our new strategy worked. Day 4--today--dawned with a dead calm and almost no wind. Perversely, the area around Hawea Point where 5690 liked to hang out was the only water that we could see anywhere with whitecaps. Still, it was the calmest we'd seen. 5690, apparently being an alternate day turtle, showed up on cue. The first time, our intrepid spotter signalled frantically from shore. Alas, the kayakers never looked the right way. Appearance number one, blown. Ursula directed the kayak into position, and the wait began. Waiting. Waiting. More waiting. No 5690. 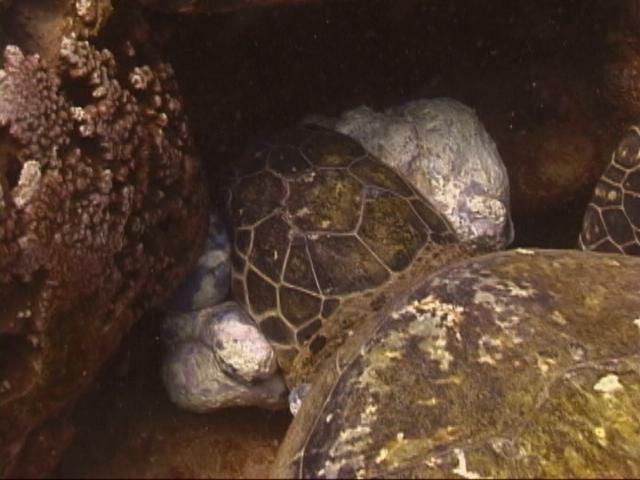 Peter decided to get in the water to see if she could be seen resting on the reef below. 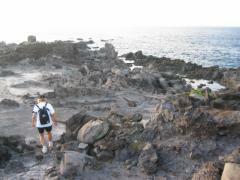 He saw a manta ray (no picture) but no 5690. He climbed back in the kayak, and Mickey took a shot at it. 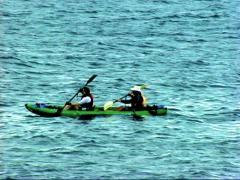 Minutes later, Peter spotted 5690 and paddled madly toward her. He got there, squeezed off some shots, but 5690 was in a shy mood and didn't raise her head. He got a nice picture of her transmitter, however. A nice picture of her transmitter. We saw her again while Mickey was still in the water, and he took the Canon and dove to try to get an underwater shot of her as she retreated to her resting place. Alas, it was not to be. Although it was a terrific effort, the resulting picture was fuzzy--the autofocus wan't up to the task. So that's where the quest stands this week. We aren't sure yet whether we'll make another attempt. We know where she is, we know she's okay, and we do have pictures. We just don't have the one we'd hoped for. An unexpected result from our efforts to find 5690 was our introduction to a new ohana. Donna Brown, who among other things is responsible for turtle strandings on Maui, lives near the area where 5690 had been sighted often over the past year. Since Donna is also a SCUBA instructor, George Balazs mentioned that we should contact her to see if she had any ideas about places we could look. Donna said that while she hadn't seen 5690, she did know a place where to find a lot of turtles, so we arranged to snorkel there with her. To do so required permission to cross private property, which she arranged. We didn't find 5690, but boy did we find turtles. Lots and lots of turtles. 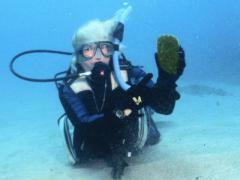 We were so enthusiastic about the site that Donna offered to see if we could be given permission to dive there once or twice a week. Thanks to Donna and friend of hers who owns a unit at this particular condominium, we were given the go-ahead! We had always wanted to document another ohana for comparision to Honokowai, and this is our chance. We did our first dive there on Friday. The reef where our new (as yet unnamed) ohana hangs out is a short snorkel from shore--about half our regular snorkel--and is in shallower water, so longer bottom times! It couldn't be nicer, right? Well, yes it could. 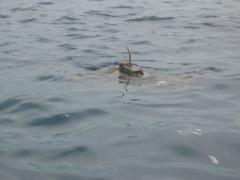 The first thing we noticed is that almost all the turtles we saw had tumors. 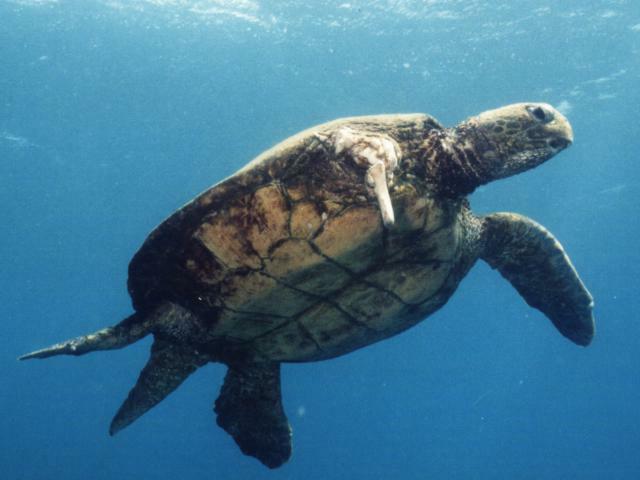 At Honokowai, most of the turtles these days don't have tumors any more. Oh, they've all had FP, but they've recovered. What's going on at the new ohana? Obviously, we have no idea after just one dive, but it doesn't look good. 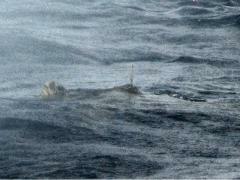 Another haunting sight was a large male who seems to have had an encounter with Mr. Tiger Shark. 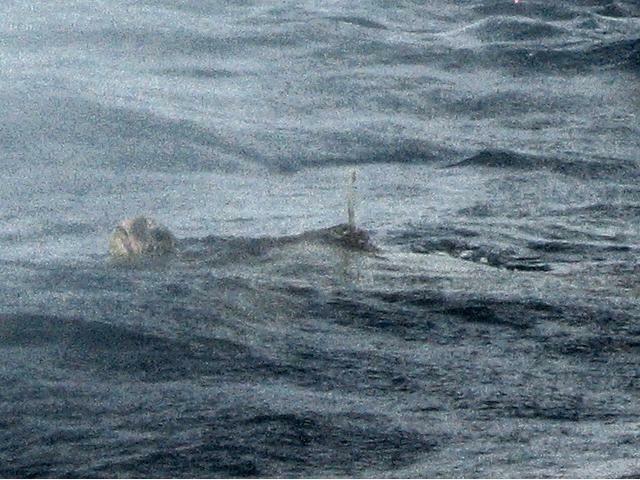 He was drifting above the reef, not swimming actively like most of the other honu. His shell was covered in algae, an indication that he has been spending a lot of time resting and not anywhere where cleaners were working. The evidence of his experience was his left front flipper--or what was left of it. The bone protruding from a mass of grayish-white necrotic tissue was enough to break your heart. The bone protruding from a mass of grayish-white necrotic tissue was enough to break your heart. We don't know whether this poor fellow will survive, but we haven't written him off yet either. 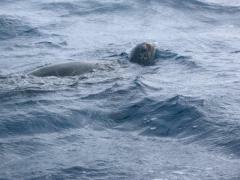 Last summer, George, a Honokowai male, lost a flipper and it looked equally gruesome. 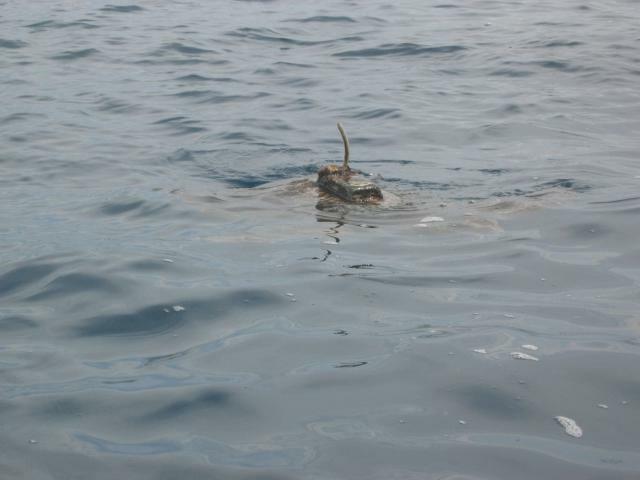 This summer, however George seemed to have recovered as nicely as a honu can after losing a limb. Another interesting event on this first visit to the new ohana was the discovery of somebody's calling card. Well, we found it interesting anyway. It was absolutely the largest, um, lump of turtle feces that we'd ever seen. In fact it was the largest ever, period--and it wasn't all there! It was the largest ever, period--and it wasn't all there! True students of a species are always interested in the feces because you can learn a lot about eating habits by studying, uh, you know. The thing we don't know, but we'd love to learn, is just which turtle dropped this amazing gem. You might guess that with all the chasing after 5690 and the new ohana, we didn't dive much at Honokowai this week. You'd be right. We did accomplish one thing, though. Every summer, George Balazs provides temperature loggers for us to put out. Usually we plant three--one at Zeus's Lair, one at Mt. Balazs, and one at The Rock. We recovered the loggers with a year's data in the first week we were here, but it was only this week that we replaced them. It's been that kind of summer. This week we replaced the temperature loggers.